Seems I have hit the wall in terms of blogging daily. Due general pace of life I have been unable to blog after each flight recently, so I’ll continue my trend of wrapping up recent flights in a single, catch-up blog. Focus of this entry is nav flights 3 and 4. Both flights were very similar in terms of flight plan, tracks and locations. Nav 3 was special in being a checkride with Ashley (the Grade 1 instructor who reviewed me prior to my first solo and first area solo flights), and Nav 4 in being my first solo cross-country flight! Nav 3 took place on Tuesday (19/04/11) and Nav 4 on the next day (Wed 20/04/11). After my 2 apparently successful initial nav flights (see entries for Cessnock and Cowra/Orange flights), John evidently felt that it was time to send me up again with Ashley to see if I was ready for my first cross-country solo. So this flight was planned as a foray out over the ranges via Warragamba and Bindook down to Goulburn and return to Bankstown. The wrinkle in all of this is that Ashley was required to give me a diversion to another waypoint or destination en route, but he wasn’t allowed to tell me where in advance. So I didn’t know if we’d make Goulburn and then divert elsewhere on return, or whether I’d even make Goulburn. The flight was in FTU, an aircraft I’d flown in only a couple of times, very early on in my initial flight training. Turned out it didn’t even have a working ADF (Automated Direction Finder), meaning I couldn’t make use of the NDB (Non Directional Beacon) navigation aides en route and had to rely solely on dead reckoning. It wasn’t bad practice actually. The flight very nearly didn’t take place. FTU had apparently experienced severe spark plug fouling earlier in the day, and the same problem occurred when I was doing my run-up checks. (Very low RPM’s and rough idling when I checked my right magneto during run-ups). So we had to taxy over to the other side of Bankstown Airport to Schofields’s maintenance provider to see if we could fix the problem. A new spark plug on the lower left hand side of the engine and we were on our way, aided by the tower’s permission for us to take of (unusually) on 29 Centre to avoid me having to taxy all the way back to the opposite side of the airport again. Out over Warragamba Dam at 4,000 feet and then turned left towards Bindook, a major NDB/VOR (Very High Frequency Omnidirectional Radar) installation located south-west of Warragamba in the Great Dividing Range. Notwithstanding my lack of a working ADF, my track to Bindook was almost spot-on and Ashley pointed it out to me as we approached it – a cleared area amidst wooded hills. Over Bindook, Ashley sprung the diversion on me. Could I please divert to Wollongong (YWOL), sorry we won’t be going to Goulburn today. Dragging out my map, protractor and navigation ruler, I worked out a new track to YWOL fairly easily, along with an estimated time of arrival, and turned left to find Wollongong. Much to my pleasure, about 15 minutes later we dropped over the escarpment around Wollongong to find Albion Park Airport directly in front of us! Doing an orbit to drop down from 5,500 feet to circuit height of about 1,000 feet, we joined mid-crosswind for Wollongong’s 16 runway and made a pretty decent landing. Given the option, I elected to stop at YWOL for 15 minutes (as opposed to doing a touch-and-go landing) as I was getting a bit sore and wanted to stretch my legs. As it happened, Ash both lives in the YWOL area and did his flying training there, so he knows the airport intimately. We taxyed over to park outside the HARS (Historical Aircraft Restoration Society) hangar, grabbed a bottle of water and had a quick peek into the HARS maintenance hangar. All manner of wonders lay within, which I’ll describe later in this blog. Our break over, we started up and headed off again, making a downwind departure from runway 16 and climbing quickly to 3,500 feet (to clear the escarpment around YWOL) and heading more or less due north for Appin and Menangle Park. Once at Menangle Park (which is also an inbound reporting point for Camden Aerodrome), we map-crawled the rest of the way home to 2RN and Bankstown, remaining just to the left of the Hume Highway to avoid infringing upon Camden Aerodrome controlled airspace to our left and on the Holsworthy Army Barracks and military zone to our right. Joining crosswind for runway 29R at Bankstown, I made a really damn good landing and we were home. Ashley declared himself more than satisfied and that I was good to go solo the following day, weather permitting. Although I’d planned on heading solo to Cessnock for my first solo (having been there on my Nav 1 flight), John and Ashley were reluctant to send me there as they felt that I needed at least one more flight through the northbound and southbound lanes of entry before doing them solo. Ash wanted me to head to Goulburn as originally planned on the previous day. However, weather was getting in the way and as there were storms forecast (30% probability) around Goulburn, both I and Ash weren’t comfortable going there and Bathurst was not an alternative as the cloud base over the ranges was looking just too low. So I proposed a brief first solo flight, literally Bankstown down to Wollongong and return. However, Ash felt that this was too short (you need a total of 5 solo cross-country flying hours as part of your pre-requisites for achieving the Private Pilot License), so I had to revise my flight plan to do as follows: depart Bankstown, head down the Hume Highway to Mittagong, continue to Marulan (distinguishable by a large cement factory and a couple of large truck stops), then head direct to Wollongong, land, then return home. I fuelled up UFY (in which coincidentally I did my first circuit solo) and headed out. Taking off from 29R, I turned south-west for Menangle Park and, achieving Menangle, climbed to about 3,000 feet while tracking towards Appin. Over Appin I then turned south-west and more or less just tracked down the Hume Highway towards Mittagong, only getting up to 4,500 feet as clouds above were a bit dark and heavy. I successfully located Mittagong Aerodrome then continued southwest for Marulan – though a bit carefully as the weather off in the distance looked dark and showery. I wasn’t sure weather I was going to make Marulan or turn around and head for home or the coast. A good 10 minutes before I expected to reach Marulan, I spotted a large cement processing factory off to my left. Surely this couldn’t be Marulan already? I forgot to look for the truck stops that Ashley mentioned to confirm if I was there already. I was faced with a decision though. If this was Marulan, then now was the time to turn left and head for Wollongong. But if it wasn’t – how many prominent cement factories could there be within a 20 mile radius of the Marulan area? And did I really want to head closer to some dark looking weather, especially on my first cross-country solo? Reasoning that if this wasn’t Marulan I still wasn’t very far away, and that regardless, my planned track to Wollongong would take me back to the coast within reasonable proximity to Wollongong regardless if I was actually at Marulan or still a bit to the north-east. So I turned for Wollongong and 15 minutes later dropped down over the coastal escarpment to find myself only slightly to the north of where I’d reached the coast yesterday, and still very close to Wollongong Airport. Joining mid-crosswind for runway 16 (again), I was a bit startled when a Jabiru joined the circuit on the base leg and not too far in front of me. I’d made my appropriate radio calls on the Wollongong CTAF and hadn’t heard anything from the Jabiru so I was a bit narked when he made is joining-base call and appeared from my right, but of course I did the right thing and avoided him, extending my downwind leg to leave enough room for him to land and vacate the runway before it was my turn to land. I then made a good landing (my landings really are better again this week!) and taxyed to the same parking area as the day before, just next to the HARS museum hangar. Parking UFY, I went for a stroll to stretch my legs and took a few quick phone snapshots outside the HARS hangar. 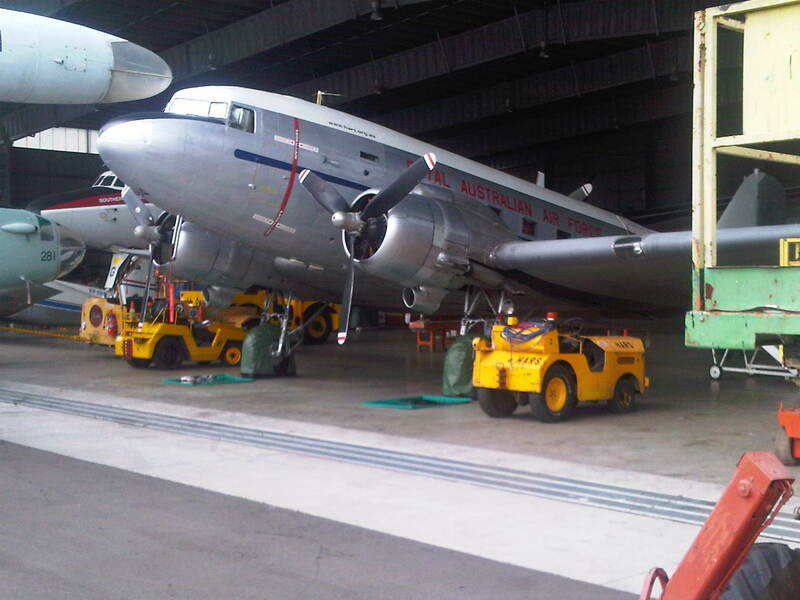 Notably, HARS operates the only operational, flying Lockheed Constellation in the world! 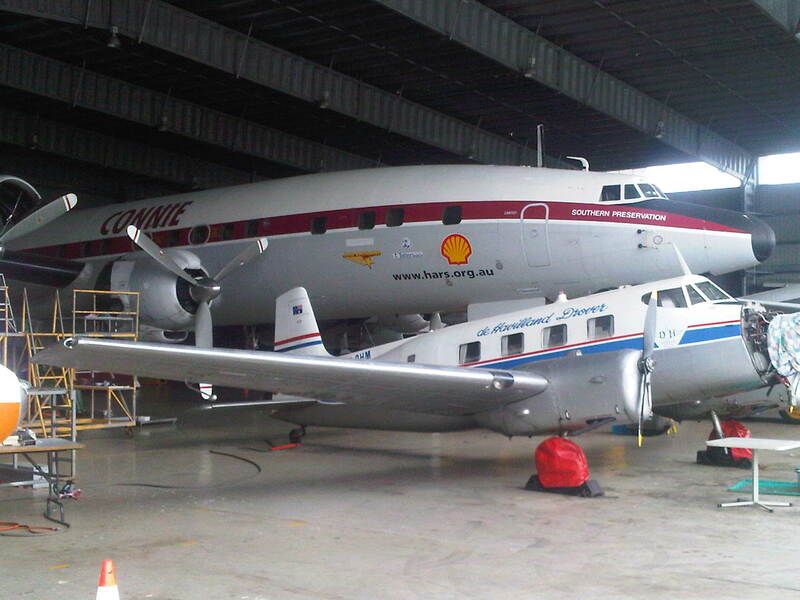 Known affectionately as “Connie“, this magnificent aircraft lives at Wollongong and, courtesy of my ASIC card entitling me to be airside at RPT airports, all I had to do was stroll over to the hangar door to gape in appreciation! Tourism done with, it was time to head home. I got back into UFY and retraced my steps from the day before, the only wrinkle being that I found myself at Menangle Park before I registered that I’d already flown over Appin! This and my earlier doubt about Marulan alerted me to the fact that a couple of my nav calculations (specifically my estimated time intervals between waypoints) may have been wrong, as I wasn’t in any significant headwind or tailwind. Your flight plan is just that – a plan. Check and double-check it carefully so you can be confident in your tracks and calculations. But don’t expect everything to go to plan. Be prepared to deal with the unexpected, as and when situations arise. Think on your feet! A final, again pretty good landing at Bankstown and I was home, well stoked I may say after a 2.0 hour flight being my first cross-country solo. I was very pleased with myself! The most enjoyable flight I’ve done so far. In my last post I wrote that there are many influences and experiences from various stages in my life that inform my interest in aviation and how I feel about it. As I’m finally within a few months of starting my training, I’m finding myself casting my mind back to how I got so engaged with flying in the first place. In this post I’ll talk about my childhood influences and memories, and in coming posts about some of the influences from my adult life and experiences. Alert – long post follows. In terms of love of aviation and aircraft, my earliest influence is probably my dad. He’s always been pretty keen on aircraft. As early as I can remember, he would talk to me with interest about the large civil aircraft we saw in the sky or he’d flown on in the 60’s and 70’s or seen as a kid – classics like DC3’s and DC9’s, and Boeing 727’s and 737’s. So I’ve probably got fond paternal memories linked to aviation. Add to this the fact that both of my grandfathers were, in various ways, connected with flying during the war (WWII, that is). Mum’s dad – my grandpa – was a RAAF navigator on the Catalina flying boats during the Pacific campaign. From the limited amount he told me directly, I gather most of the missions he flew on involved aerial mining and reconaissance. He was also involved with ferrying aircraft from the USA to Australia at the end of the war. I still have some of the artefacts from his flying days – his log books, military records (sourced from the Australian War Memorial) and campaign medals. Dad’s dad – my poppa – was (I think) an automotive mechanic in the RAAF, and though he never left Australian shores, I find his aviation connections equally resonant. I mean, flying’s not just about the people in the air, it’s also about the many, many people who work in support of the direct aviation activities. I have his military records also, and there are one or two bits of hardware still at my dad’s place that I think poppa might have “borrowed” from the RAAF – a large, heavy, grease-lubricated car jack for example. A few years later, I experienced a quite different flight, but equally special. My parents put me on a plane from Sydney, by myself, to go visit my grandparents in Toowoomba. It was a little East West Airlines (now defunct, of course) Fokker Friendship F-27, which flew from Sydney to Coolangatta, then on to Oakey, from where my poppa picked me up at the aerodrome. The flight was nearly empty. I lapped it up – I was by myself, I got special attention from the stewardess, and because we only flew at around 15,000 feet altitude, I had a very clear view of the landscape beneath us. The F-27’s had a very distinct, slightly “whining” sound with their twin turboprop engines – that sound used to be very common in Sydney skies until F-27’s were phased out. But we did do some cool stuff of a practical nature. One weekend we went down to a dusty little community hall in Sutherland in Sydney’s south to have a go on an old ANT-18 Link Trainer that had survived the war and was in the custodianship of the Australian Air Force Cadets. This was a WWII-era flight simulator designed to train pilots to fly on instruments. Again, the learning support was not great – some gruff bloke planted me in the cockpit for 5 minutes, barked some instructions at me and exhorted me repeatedly to “keep your eyes on that three”. I had no idea what he was talking about, was too timid to ask him what he meant, and proceeded to repeatedly put the simulator into a simulated stall – whereupon he gave up on me and unceremoniously turfed me out of the trainer to give someone else a turn. It was a bit disappointing, but it was still cool to have had a go in a real “live” cockpit environment. Probably the coolest memory, though, is a flight we took one day out at Bankstown – my first flight in a light aircraft. It was a Cessna 172. We went for an hour’s joy flight, must have been around the Bankstown training area. I was overwhelmed – everything seemed so immediate. In a large passenger aircraft, you’re removed from the sky and enclosed in a large metal cylinder, but in a light aircraft, the sky is yours – it’s all around you! I remember the feel of the aircraft moving with changes in wind direction and air pressure, and I particularly recall the pilot putting it into a moderate bank – looking “straight down” to the earth below and thinking “I gotta do this one day”. This, more than any other of my childhood experiences, was the point at which I really and truly caught the bug. The last of the early memories I have is from when I was in high school. I was a member of the Australian Army Cadet Corps and one day we made a trip to Richmond Air Base for a look around and for a flight. We looked over a C-130 Hercules and also a DHC4 Caribou (just recently decommissioned by the RAAF), and then took a flight in the Caribou down to Wollongong and back. Those of us in the Caribou were fortunate enough to experience the thrill of strapping ourselves in as they opened up the back of the aircraft during the flight – as happened when, for example, aerial supplies were dropped or paratroopers were dropped down to a landing point. I thought this was pretty damn cool. So, lots of poignant aviation memories and images from when I was growing up. I’ll talk in the next post about some of my adult influences.